Deep within the forest, you might imagine you see a face within the leaves or the bark of a wizened tree. That is the face of the greenman. Originating back to the medieval ages or even before, this enigmatic icon has appeared on ancient carvings and historical documents, adding to both its mythos and mystery. 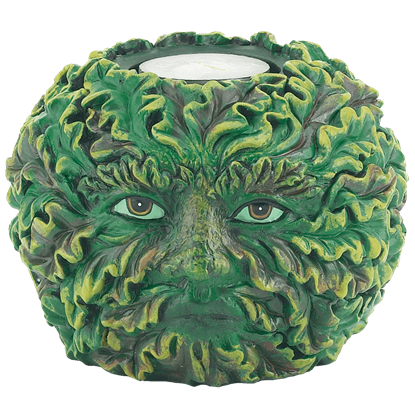 Our greenman home decor and gifts feature greenman faces in home accents that will add mythic style and sometimes even extra practicality to your surroundings. 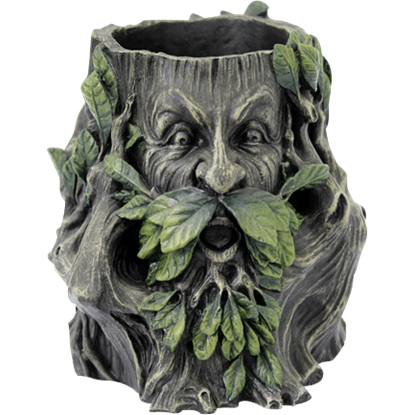 Here you will find everything from greenman pen holders and greenman scrying bowls to greenman tables with bases like carved statues revealing a visage of tree bark, leaves, and vines. All of our greenman home accents are highly detailed and often painted by hand, ensuring that they all have a stunning appearance, many of them highly realistic. 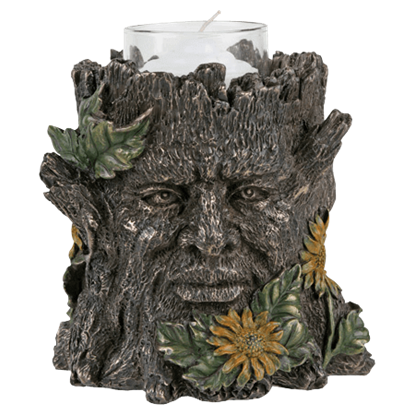 You will also find greenman decor here with a slight fantasy bent to their design, perfect for recreating the feel of an enchanted forest in any room of your home. Calling the Green Man Candleholder one big green man is being a bit generous. It is indeed a depiction of a green man, but calling the candleholder big is somewhat erroneous. In fact, this candleholder is quite modest in size. 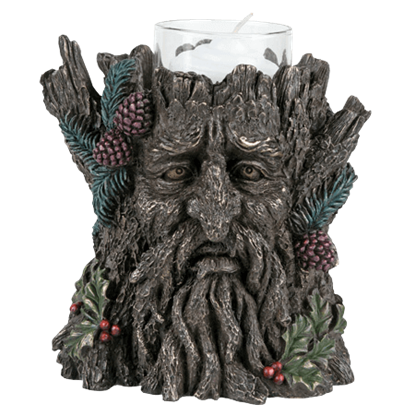 It could be your imagination, but does the Green Man Incense Burner with LED Eyes actually watch you? 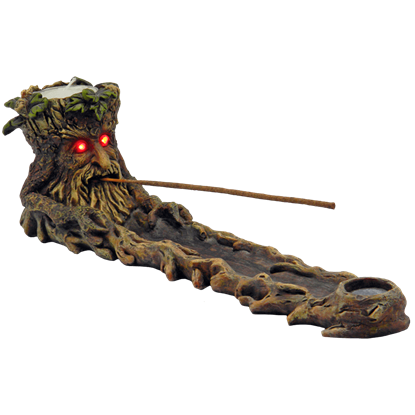 This incense burner does indeed watch you, all while holding your favorite variety of incense along with a nice candle. Because the green man is made up of vegetation and plants, he can appear virtually anywhere without having any purpose other than decoration. That is why he is on the Green Man on Cross Candleholder. 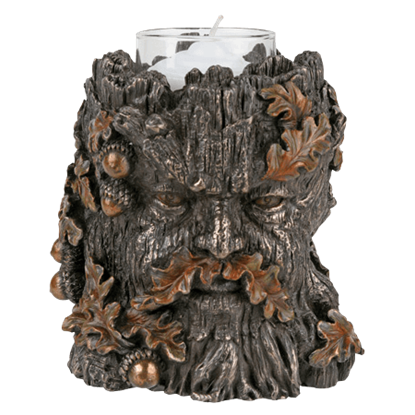 This green man votive holder features a green man ready for fall! He is covered in leaves and acorns. It would make a great gift for any family member or friend. Check out our Green man Section for the other seasons! This green man votive holder features a green man surrounded by cheerful sunflowers to represent the warm summer months. It would make a great gift for any family member or friend. Check out our Green man Section for the other seasons! 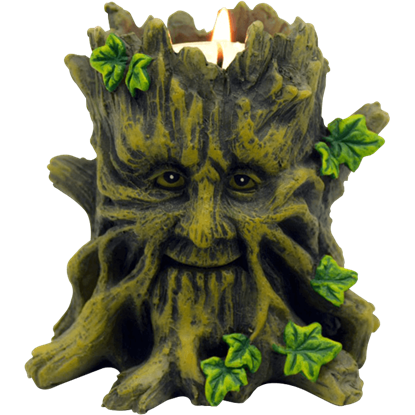 Welcome a kindly spirit into your home with the Greenman Tealight Holder. 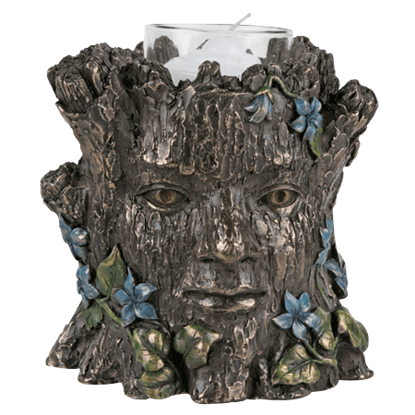 This hand painted votive holder has the look of a leafy tree trunk with the smiling face of a greenman. One tealight candle fits at the top of the trunk. This green man votive holder features a green man ready for the cold winter months. He is surrounded by holly berries, holly leaves, pine needles, and pine cones. It would make a great gift for any family member or friend. This green woman votive holder features a beautiful maiden ready for spring surrounded by tiny purple flowers. It would make a great gift for any family member or friend. Check out our Green man Section for the other seasons! Covering his ears, this depiction of the Greenman represents the second of the three monkeys from a famous proverbial maxim. 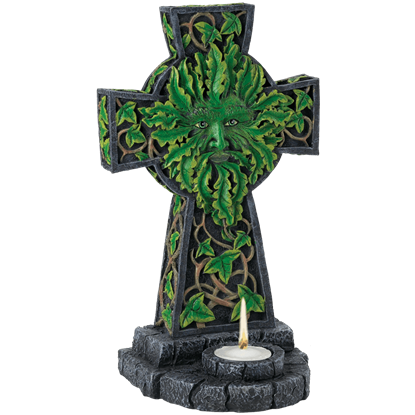 The Hear No Evil Greenman Votive Holder is a great reminder to always be of good spirits and a kind heart.